Loosening the Knot | A Continuous Lean. So we have yet another dispatch about the disappearing necktie–not that we needed one, since they’re not even required at the 21 Club (is nothing sacred?). Now, according to the New York Times, the tie is being forgone by politicians trying to cultivate the common touch. By all means ditch your tie if you must, but remember that there’s a way not to not wear a tie. First: don’t just look like you just took your tie off and unbuttoned your shirt. You don’t want cultivate the impression that you arrived at a bar straight from work. No, tielessness must be of a piece. That’s to say, don’t wear a dress shirt with a stiff collar that’s intended to be buttoned up to the top. Too often, when these shirts are undone the collar is so heavy that it droops like a dying tulip. Your shirt could be of a pattern or not, but it should have a soft collar, with no back facing, like the nice rolled collars of old Brooks Brothers button downs. For something more daring the maestro Salvatore Piccolo can show you the way. Though if you’re not prepared to embrace studied Italian nonchalance then Turnbull & Asser makes more traditional shirts whose stiff collars maintain their integrity. The shirt buttoned to the top, sans cravat, has a certain rigor without being formal. It’s a chance to contrast color, pattern and texture. Though you can certainly simplify matters, like David Lynch’s monotone, or push things further, like the Rain Man casino scene, if you’re into sharp lines and counting cards. 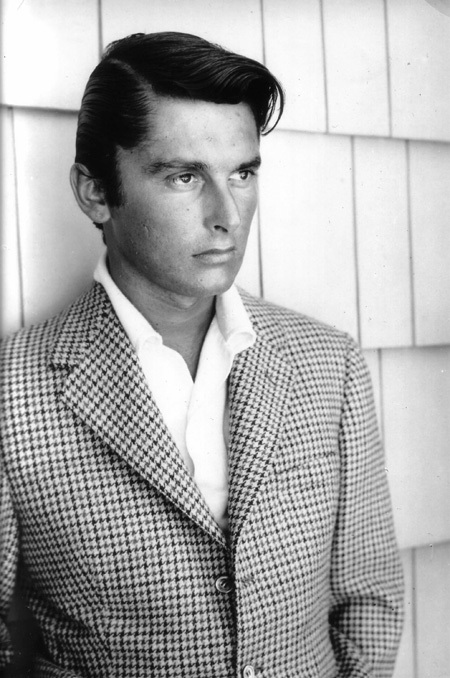 Robert Evans sans tie. Also note the wonderful roll of that collar. The editors of Fantastic Man released a wonderful, slim book of essays called Buttoned Up. The introduction notes: â€œThe simple act of fastening a shirt’s highest button and the plainness of the look it creates belies a variety of intricate and complex intentions.â€ Indeed! It continues to say that the look is â€œat once proper in its neatness and rebellious in the deliberate exclusion of the tie.â€ Yes wear your Lacoste shirt buttoned au maximum or a simple Oxford. Just put some purpose behind it. Its shouldn’t seem like a default setting, but what you meant all along. Is all of that a little too considered? Then unbutton two buttons and forget all about it. You can do this whether you’re going to a Riviera nightclub or have joined Nick Cave’s band. Wear a deeply unbuttoned white shirt under a velvet jacket like you woke up in the lobby of the Chateau Marmont and lit a cigarette before the management ejected you. Personally, I dream of the return of the knit tie, such a terrific textural solution for so many men, but I’m not holding my breath. So go forth unencumbered by tradition, but remember: When you’re shunning formality it’s best to do it from a position of strength. David Coggins is the author of the book, Men and Style, published by Abrams this October. But to do any of this right, spend the money on the right shirt … please! The dumbing down of American culture continues. No one should ever, under no circumstances, wear a button down collar with the top button done up without a tie.